But after a few hours hands-on time, I’ve changed my mind. 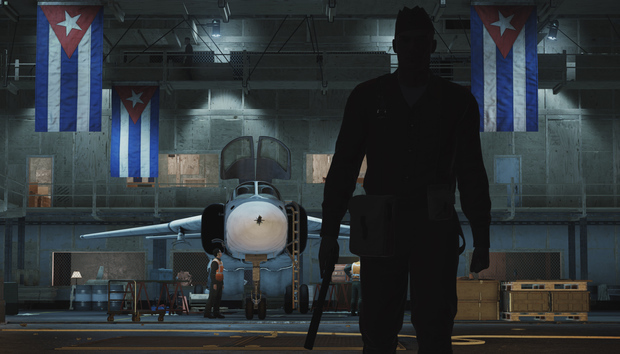 Don’t get me wrong: Hitman could still end in tragedy. I’ve only played the opening bit—a.k.a. the most-polished bit, the bit that is supposed to release next month. After that point, who knows? Square/IO Interactive have promised a bunch of content in the pipeline, including new maps and missions, but if there’s anything I’ve come to expect from episodic releases it’s a latticework of delays, rushed content, and missing features/bugs. So we’ll see. The important thing is I believe it could work, provided everything goes well. The game opens with a training mission. Infiltrate a yacht, find the target, kill the target. It’s not an especially difficult mission, nor is it very large. I finished it in maybe ten or fifteen minutes, first by disguising myself as a dock worker and then as a member of the yacht staff, eventually taking out the target with a silenced pistol. Not the cleanest job, but I escaped with no witnesses. Good enough to get paid. But after I finished, something important happened: The game urged me to go back and replay the mission—not just once, but as many times as I’d like. Until I felt comfortable, I guess. Replay a mission? It seems a small thing, no doubt. I dwell on it though because it marks a return (of sorts) to Blood Money’s design ethos. Hitman: Blood Money is many people’s favorite entry in the series, and for good reason—large (at the time) areas, hundreds of different ways to get through missions, an emphasis on stealth, ways to make targets look like “accidental” deaths. It encouraged players to devise new solutions, to improvise, to learn the systems and play old missions over and over. Its sequel, 2012’s Hitman: Absolution, did not do those things. There always felt like a “right” way of accomplishing Agent 47’s task. Items were typically placed in the most obvious place to use those items. Mission areas were small—and hell, most missions didn’t even involve killing a target. The open-endedness was subsumed by a tacky, Hollywood-esque story, shuttling you from set piece to set piece. And so it makes sense for IO to be ringing the Blood Money bell. “We swear, we learned our lesson,” says IO. “We’re going back to Blood Money.” Going back, it’s worth noting, to a game that’s now a decade old. It’s worth noting because Absolution came about for a reason. Not necessarily a reason I or the Hitman fans would agree with, but a seemingly-accepted “Truth of the Industry”—that games must be more accessible, allow for less error on the part of the player, go bigger and more spectacular with each new entry. Which brings us in roundabout fashion back to Hitman, 2016 Edition—not really a return to Blood Money as much as an updated Blood Money, or a fusion of Blood Money with some of Absolution’s less-offensive ideas. This new Hitman’s opening yacht mission is hardly going to land amongst Agent 47’s best—it’s not even as complex as Blood Money’s “Death on the Mississippi” mission. It’s a tutorial. But by encouraging players to try new tactics so early on, it indicates those other tactics exist. That’s important when you reach the next mission (a “test” for Agent 47, set on a Cold War-era military base) or when you reach the actual meat of next month’s release, an enormous Paris map filled with bystanders and objects. And those other tactics had better exist, because Hitman’s success as an episodic title relies on there being a reason to revisit between releases, to test out new methods of execution. If I find myself less skeptical of Hitman as a piecemeal game, it’s because I can imagine a well-crafted Blood Money level giving players a month’s worth of routes to discover. A half dozen of those, and an episodic release makes more sense. That’s what Blood Money contributes. As for Absolution, its icy hands can be felt in two aspects of the game. 1) Disguises. They work the same as in Absolution, meaning people wearing the same clothes will often see through your disguise while others will remain oblivious. This was one of Absolution’s best changes, though it became punishing in levels where every single guard wore the same uniform. Hitman, 2016 has so far ameliorated that problem by making sure multiple guard types are present even when it doesn’t strictly make sense. For instance, the military base has gun-toting soldiers and officers. Soldiers will detect Agent 47 in a soldier outfit, officers will detect him in an officer’s outfit. Also, the time before you’re discovered seems a bit more forgiving this time around. 2) There are a bunch of player aids, for those who’re new to the series or perhaps prefer a bit more structure. Chief among these is “Opportunities,” which basically lead you through a level’s unique assassinations step-by-step once discovered (by listening to conversations, for instance). For my own part, I wanted to toggle them off pretty much immediately. Luckily, IO was quick to specify you can do just that. Turn all (or most) of them off, if you want a more Blood Money-esque experience. Barring a few pre-release bugs and a bit of slowdown, I’m excited by what I played. Ever since the initial Hitman announcement, I feel like I’ve been holding my breath and thinking “It can’t be worse than Absolution.” But now? Now I’m thinking it all might work out okay. Even if it is episodic. If you’ve preordered, you’re eligible for a beta starting on February 19. Otherwise, look for our review of the first chapter around the game’s release, March 11.